Have fun, don’t take life that seriously but work hard advised Ashima, FORE School of Management MBA grad Ashima Manchanda. Ashima came to FORE as a working professional and kept working full-time throughout her course. She chose FORE because under its executive program she could work simultaneously, it gave her the extra edge because applying your practical knowledge from work in subjects became easier and definitely made more sense. We have very few colleges which offer such an excellent program but she feels it will become a growing trend in the coming years. 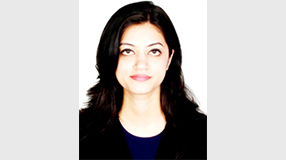 Ashima comes from commerce with mathematics and communications background, working first as a finance support for SAP at Agilent Technology, then as executive assistant to the general manager at Hilton Garden Inn and then moving into marketing and communications at Hilton Garden Inn. Her current position includes developing and implementing the communications and media relations program for the hotel; developing and implementing all advertising, promotional, and marketing and PR campaigns for the hotel; establishing channels to manage media and internal communications and developing all written material, newsletters and monitoring various online channels for the hotel.